Fernie is located roughly 3.5 hours south of Calgary in beautiful British Columbia. 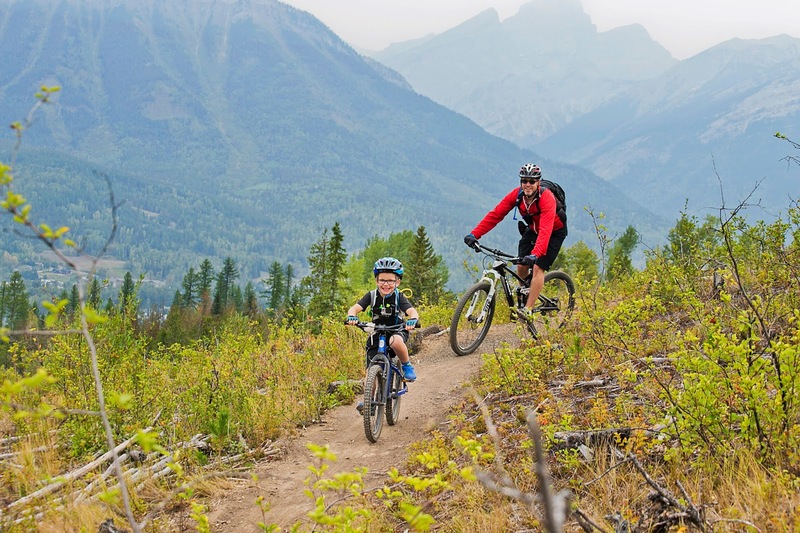 It's an easy destination to reach for a long weekend in the summer and has become one of our favourite places to visit for a family mountain biking destination. This story has been UPDATED FOR 2018 and will receive regular updates every time we discover a new trail. First time on the Lazy Lizard Trail and we are huge fans of this trail now! 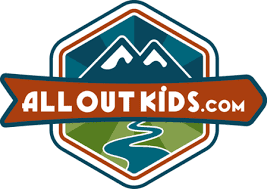 This should be your first stop in Fernie if you are serious about introducing the kids to the sport of mountain biking and want to build up some necessary skills for the surrounding trails. Even if mountain biking isn't really your style of biking, this park is FUN and kids love it!! Friends who visit it for the first time usually tell me they couldn't get the kids to leave for hours. I've written an entire story on bike skills parks and pump tracks so I'll refer you to that story, Pump Tracks and Mountain Bike Parks, for more information on the Fernie dirt jump park. The Fernie Bike Park is conveniently located next to the town spray park and aquatic centre downtown. It is also the hub for a number of family-friendly bike trails and there's a giant parking lot big enough to park a trailer in. You'll find this fun rollercoaster feature below on one of the practice loops. 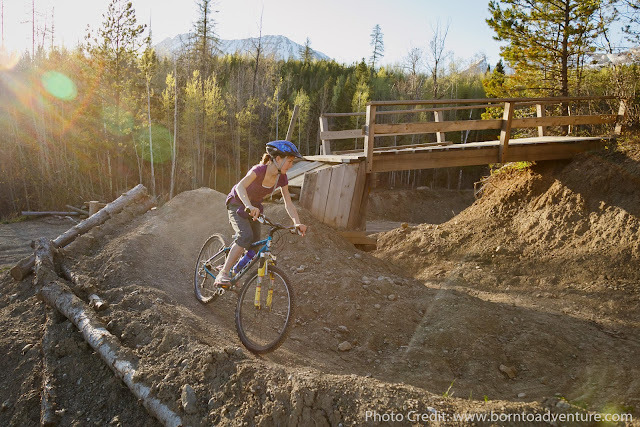 The Fernie Recreational Trails are family-friendly and well maintained for a variety of users. Cyclists should expect to come across hikers, pedestrians, dog walkers, and even the odd motorized wheel chair along the river. Easy riding on the Fernie Recreational Trails. Below is a quick overview of the trails that make up the big loop and HERE is the MAP. Note that the colour of trail does not indicate easy vs. intermediate. Green is just green. Blue is just blue. They are all easy! The Kootenay Elk Trail - This trail is part of the Fernie Main Loop which is 8.2km in length and follows the blue circle on the map. We biked most of this loop except for the downtown connector trail. 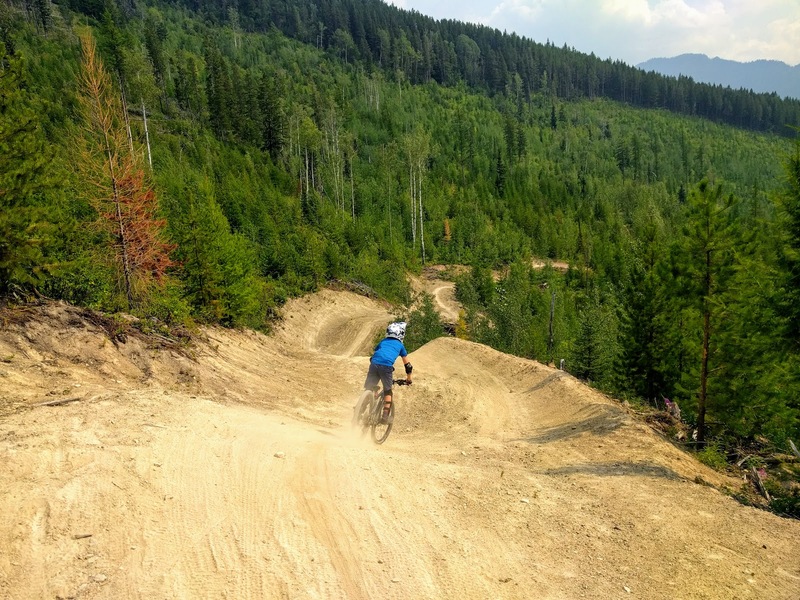 The Kootenay Elk Trail is unremarkable as far as trails go and basically serves to connect you to other more interesting trails such as Old Stumpy and the Great Northern Trail. It is mostly flat and very evenly graded for easy riding. Old Stumpy - This is probably the hardest of the recreational trails. Old Stumpy is more of a singletrack trail and has a couple sets of stairs that you may have to walk around depending on the direction that you are going. There is also a fair amount of climbing (from both directions) so expect to be walking some hills with young riders. 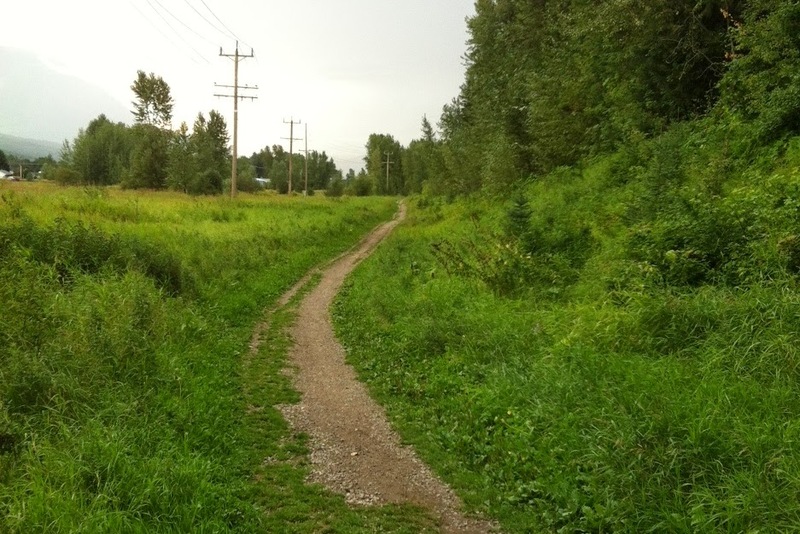 In my opinion, The Old Stumpy trail is easiest for kids if biked towards the aquatic centre. Not away from the centre as we did it. I would start at Maiden Lake in the future and bike the Great Northern Trail to get to Old Stumpy. I have since recommended this to another friend who tried it and agreed that it was easier done towards the aquatic centre. Old Stumpy is 2km long and is part of the green Great Northern Loop. This loop is 5.7km in total length. We did all of it except for the downtown connector section. The Great Northern Trail - I liked this trail and my son loved the train track crossing we had to do. As seen from the photo below, we indeed did see a train. The trail is part of the green loop with Old Stumpy. It has a short section near the river near Maiden Lake that is also scenic. The Emily Brydon and Dogwood Trails - These were the two easiest trails in the blue loop and could practically have been done with training wheels. Hardly mountain biking, they were still fun and kids love this section along the river. We stopped to throw rocks in the river at one point and friends all recommend stopping at the Annex Pond for a rest spot. The Brewery Creek Trail - I loved this trail and felt like I was out riding in the country (see the photo below.) It was easy biking but felt more natural than the section along the river. More remote. The trail was narrower but still fine for my friend pulling a double chariot. It is part of the blue loop and connects the river section with the Coal Creek trail. The Coal Creek Heritage Trail - This trail is much easier than Old Stumpy but is more singletrack in nature than the trails beside the river. 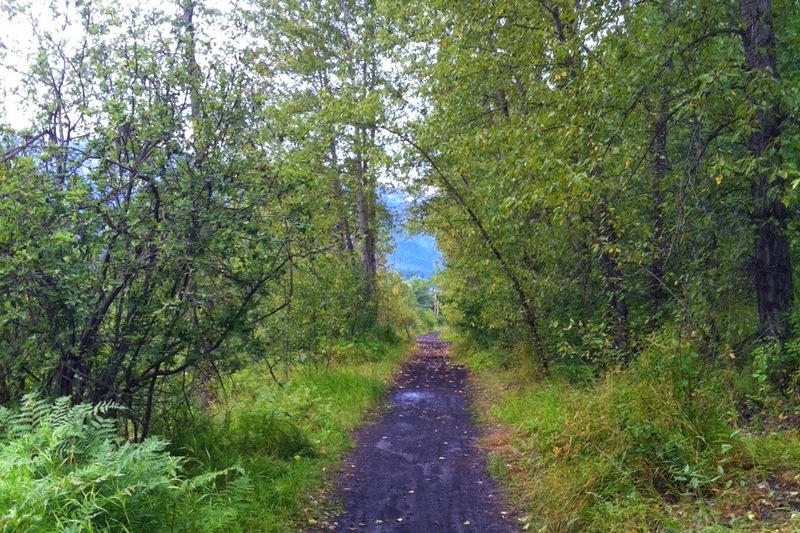 The trail follows an old railway line that connected mines at Coal Creek with the town of Fernie. The recreational loop only covers a very short portion of the Coal Creek Heritage Trail. For more information on the full 9.2 km trail, visit the Fernie Trails Alliance website for maps and access points. One word of caution for this trail - don't wear new shoes. The trail is practically made of coal dust and you will get dirty! The easiest way to bike the full Coal Creek Heritage Trail with kids is by parking at the old Coal Creek Townsite and then biking back to the aquatic centre. It is mostly downhill this way. Then an adult can ride back for the vehicle while the kids play at the bike park. 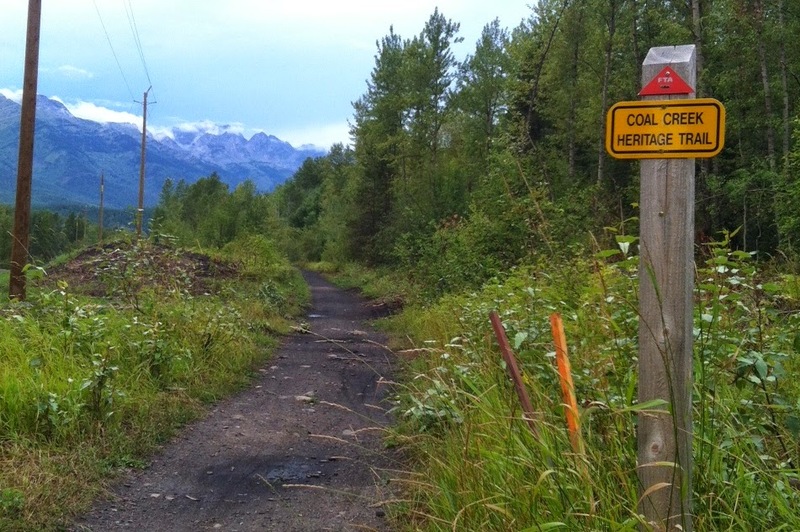 Directions to the Coal Creek Townsite are on the Fernie Trails Alliance website. You can also find the trail on trail forks in three separate segments. (and while it shows a gap between the middle and bottom parts, we managed to bike on a trail that paralleled the road the entire time. We rode the complete Coal Creek Heritage Trail when our son was 6 years old. I would have to say that a 20" bike with gears and hand brakes is the minimum requirement for this trail. 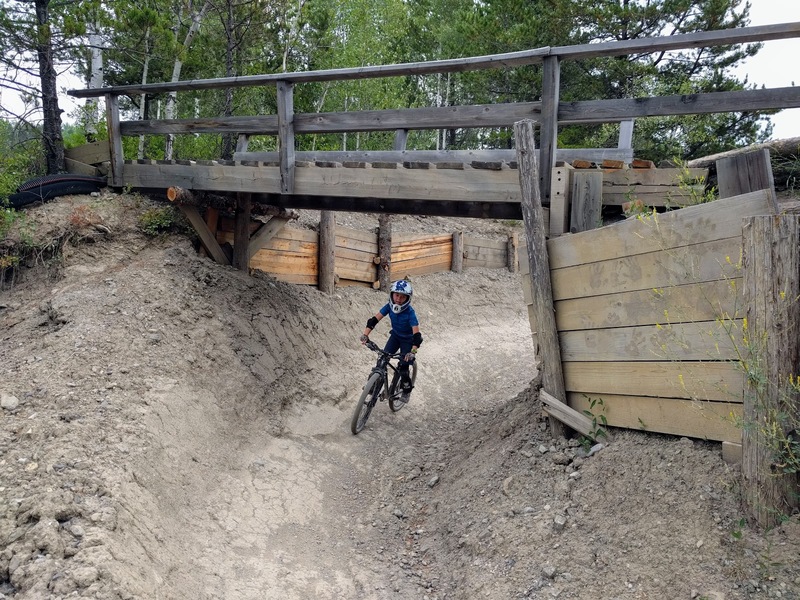 It was singletrack with a few challenging hills that this novice biking mom had to walk. Many sections of the trail were lovely, flat, and easy going, but then a difficult section would appear out of nowhere and throw us for a loop. (me anyway.) If you do this full trail with younger kids, just explain to them that they may have to walk the occasional section. You'll still be biking more than you walk, and it is a lovely ride. This past summer, 2017, we discovered some amazing smooth, flowy, gentle trails in the Montane area above downtown Fernie, and I fell in love with this area. I continue to be a fairly novice mountain biker who hates roots, drops, or overly steep trails. My son is now 8 years old and a fairly decent mountain biker - but who vehemently hates riding up hill. 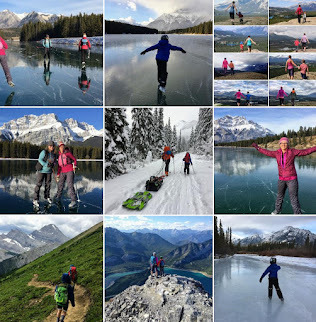 We both found the Montane Trail Network to be the holy grail of all things awesome for our abilities and preferences. We wanted to "truck drop" the Montane Trails for downhill riding into the Fernie Townsite. My husband would then bike back up for the truck while we played at the bike park in town. Following the Trail Forks App, we drove up the Coal Creek Road until we reached River Road, a forestry road that is definitely open to the public (despite the sign that would lead you to believe otherwise.) - We called Tourism Fernie to verify that we could drive up this road. We drove up the road while I followed our little dot on the Trail Forks App, and we parked along the side of the road when we reached the trailhead for Montane Blue For Evyr - one of the best trails I've ever ridden! It's a cruisy machine built trail - and it set the bar petty high for what I now consider to be "awesome trail building!" There are no roots, the hills are all pretty gradual, and this wussy bike mom was never scared. My son flew down the trail and loved it. From Montane Blue for Evyr, we got onto Montane Ruby's Way. 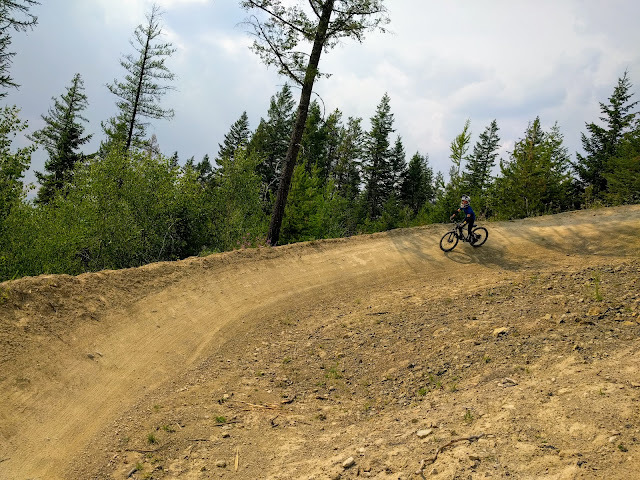 This is another machine built, flowy trail, and had a few fun sections with berms, tight corners, and switchbacks - great practice for the harder trails. Again, it was never very steep and we enjoyed this section. From Ruby's Way we followed a short section of the Montane Blue Trail (part of the Trans Canada Trail) and then got on to the Montane North Trail. This got us close to the town loop, bike park, and a variety of short trail options to finish the ride. - and all of these trails can be seen on Trail Forks. All in, we biked roughly 5-6 km with approximately 300 metres of height loss, a short ride for the morning when temperatures are hot in the afternoon. Follow the ride up with a swim at the aquatic centre or some time at the bike park. We started from the same spot as above (at the trailhead for Montane Blue for Evyr) but instead of following that trail, we jumped on to the end of the Roots Trail, heading for a beautiful viewpoint with a small hut for winter use. I highly recommend visiting this viewpoint even if you climb back up to Montane Blue for Evyr after. Eventually you end up on Montane North and you can follow any of the trails heading back to the town bike park and recreation centre. 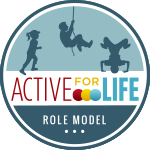 The next step up for kids who have mastered the Montane Trails. The Ridgemont Trails are more natural (less machine grooming, more roots, more drops, etc.) and they were a bit outside my personal comfort zone as a novice rider. My son did well but got a little intimidated on the Eco-Terrorist Boardwalks. Again, we wanted to "truck drop" the Ridgemont Trails so we drove up Coal Creek Road until we came to Ridgemont Road, a gravel road that is great for accessing bike trails in Fernie. Following Trail Forks, we drove up the road until we came to the trailhead for Upper Eco-Terrorist. We'd heard about these "fun" boardwalks that my friend's kids loved and thought we'd check it out. The Eco-Terrorist boardwalks ended up being quite challenging, narrow, and high off the ground - all of which was not ideal on a trail that is "multi-directional." My son absolutely freaked out at one moment when he saw another rider coming straight towards him on a boardwalk (because one of them would have to jump off in order to let the other pass) After that, we did a lot of walking and decided we'd only do this trail again mid-week when it was very quiet!! We'd also consider biking the Upper section of Eco-Terrorist in the UP direction because it only gains 28 metres of height and is definitely more popular with riders going UP to other trails. Ride it down, and you will encounter more riders coming towards you. - And the boardwalks certainly feel narrower and higher than the photo at the right shows. From Upper Eco-Terrorist (where all the boardwalks were) we got onto Lower Eco-Terrorist which was at the max. level that I could ride as a novice rider. My son did fine but he doesn't mind steep hills. I found the grade to be more gradual on the Montane Trails and the riding generally smoother (less roots, rocks and drops.) 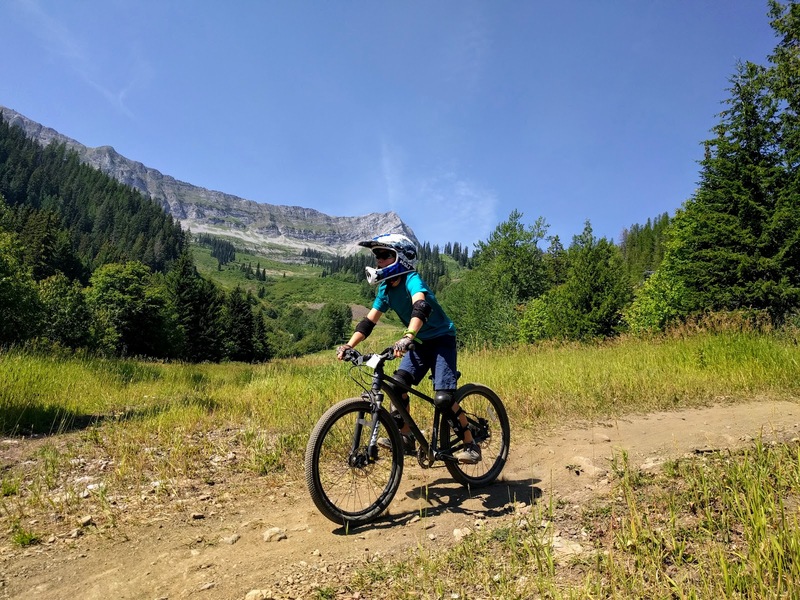 - and this is a trail that you'll probably want to ride down with kids (not up) because it has 125 metres of height loss or gain, depending on which direction you are going. It would be a slog to get up with kids. From Lower Eco-Terrorist we rode the Cemetery By-Pass Trail down towards the town bike park, and then played there a while so that my husband could bike back up to get the truck. All in, we biked less than 4 km, losing 200 metres. It was a good short ride and we'd do it again for sure. Got to practice those boardwalks! Space Unicorn is a very short trail (511 metres in distance) that's super easy to truck drop off the Ridgemont Road. The trail only loses 74 metres but it was a lot of fun for my boys to ride this summer. The highlight of this trail is the vortex wooden feature that you'll bike over. We did several laps on this trail. And note this trail has gone through several name changes. It was called Broken Hip but has been re-named Space Unicorn as of 2018. This is our FAVOURITE bike trail in the Fernie area and is very popular with families looking for a good easy downhill ride. Truck drop it from Island Lake Lodge and lose 535 metres of height on the upper part alone! Trail forks says there is also 197 metres of climbing as you descend from Island Lake Lodge but there are only a couple of uphill sections so I'm not sure where that number comes from.There was one section we hopped off our bikes to walk up, but it was short and painless. Starting from Island Lake Lodge you'll ride down the Upper part of the Lazy Lizard Trail for 7 km. This is where we joined the road and had our truck waiting for us. You could ride further though on the Lazy Lizard Connector Trail for another 1.9 km (more rolly and cross country than downhill at this point.) 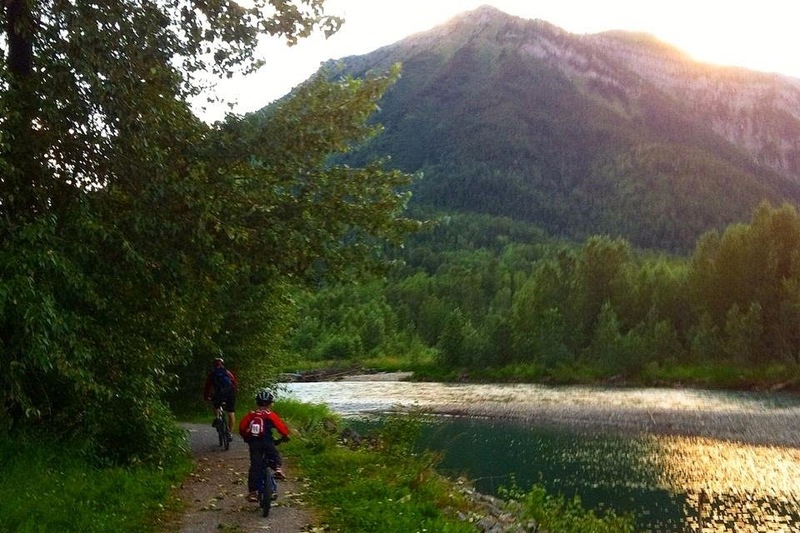 You'll finish on the lower trails in Mount Fernie Provincial Park (Hedonism/Stove Connector and other trails until you reach your campsite or the final parking lot on Island Lake Road. Overview of the trail - It is flowy, machine built, and has a lovely grade the whole way down. It's definitely downhill in nature with some berms and banked corners, but is never that difficult or technical. 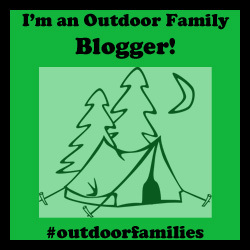 Shuttling tips: My husband drove my son and I up to the Lodge where we hung out on the patio, looked around the property, walked down to the lake and waited. Meanwhile, my husband drove back down to the end of the trail and then he biked back up the Lazy Lizard. This allowed us to all bike down together and to have a truck waiting for us at the end. I really can't recommend making the kids bike up this trail unless they like climbing. Note that the trail is multi-directional so anticipate meeting other riders coming up towards you, and keep your speed in check. - and the uphill rider has the right of way! A great trail for bridge lovers! If you're going to go to Fernie in the summer, you'll find great camping at nearby Kikomun Creek Provincial Park. And while you're here, you can bike the Great Northern Rail Trail in the Surveyors Lake Campground. The loop we did on the Great Northern Rail Trail was under 10 km in length and was generally easy double track riding. It wasn't technical at all but a few sections were very hilly. See the trail map below with a description underneath of how we did our ride. If you follow the map above, the loop from #1 to #7 is about 7 km in length and is great for introductory mountain biking. Our personal direction of choice is to go backwards from 1 to 7, down to 6, etc. And when you get to the country gravel road, that is what you will follow to connect #6 to #5. The biking along the road is actually quite pleasant. I like this loop a lot and we ended up riding it in the mornings when it was cooler at camp. Then we'd spend the afternoons at the beach. To get a map of this trail, ask the campground attendant for one when you drive into the Surveyor's Lake Campground. They'll give you a little interpretive pamphlet that tells you all about the trail and its history. There are also maps at the trailhead in a little wooden box. Parking can be found at the campers beach parking lot where you'll see a trail kiosk with maps. Don't park at the day use parking lot or you'll have to bike around the lake a short distance to reach the campground. Got some rad riders in your family looking to try trails at the next level? I'll be adding to this section over the next few years as my son progresses and we get to try more trails. Contra is Fernie's brand new downhill flow trail, this trail is full of giant table tops, berms, and steep descents. It is rated black and deserves that rating. Make sure your children have done some serious downhill riding before trying this one. Shuttle directions: Drive up the gravel Coal Creek Road until you get to the Rifle Range Road. Turn left onto this road. Take this road until you come to the Rifle Range Road Spur 3 where you turn right. And these are all shown on the trail forks app in case you're worried about getting lost. Note you'll likely want a vehicle with high clearance for the spur road at the end. The other roads were not too bad. For more epic downhill biking, check out my new story on resort biking at Fernie Alpine Resort. This story will be updated annually as we discover new trails. 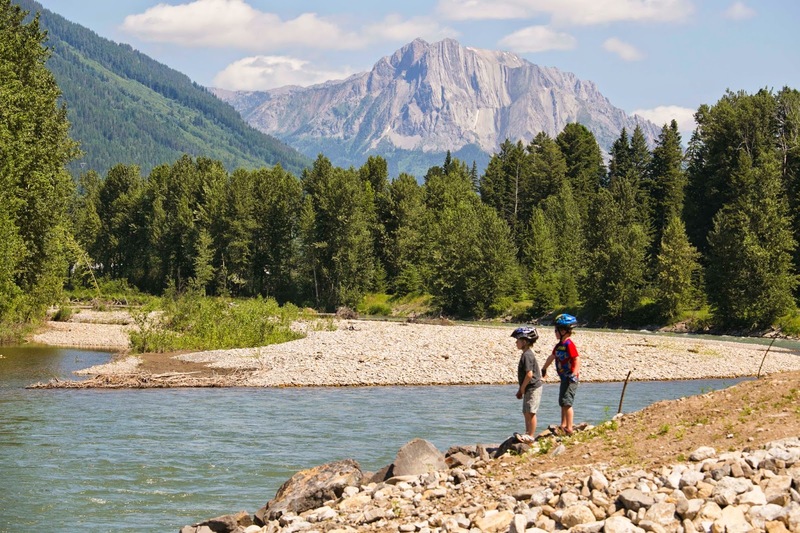 If we've missed one of your favourite family trails, please let me know and we'll check it out next time we're in Fernie. Looks good. I noticed that all the time kid's bicycles are looks so beautiful. In this post, I also get this proof again. Thanks for sharing your post with. Thank your for this post! My husband and I always loved biking and have added a couple within the past 5 years. This summer, since we moved to southern Alberta, we have been biking a lot more but have just recently started to hit the Pass, and Fernie. I was looking for family friendly trails in Fernie when I came across this post. Looking forward to do the trails you talked about in your post, starting tomorrow. Thanks again!